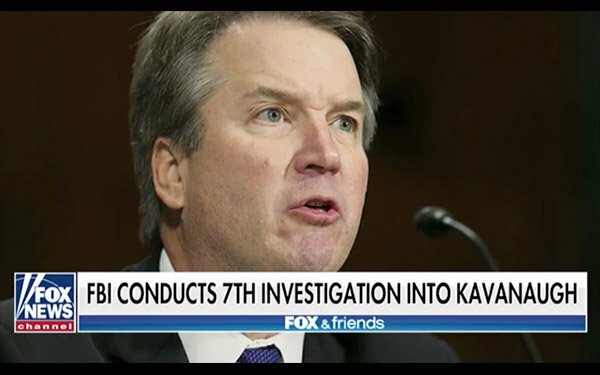 Fox News Channel posted the best TV viewing results for Supreme Court nominee Brett Kavanaugh's hearing during his Thursday testimony to the Senate Judiciary Committee. Fox News Channel posted a Nielsen 5.7 million total viewers from 10 a.m. to 7 p.m. ET. ABC was next at 3.47 million, followed by CBS with 3.24 million; NBC at 3.19 million; MSNBC with 2.89 million; and CNN at 2.52 million. That's over 21 million TV viewers in total for all networks. According to a CNN report, Fox averaged 4.69 million viewers during the testimony of Dr. Christine Blasey Ford, accuser of Kavanaugh over an alleged sexual attack -- and 7.17 million during the period that Kavanaugh was speaking. Fox also bested all networks when it came to 25-54 viewers -- key news advertisers viewers -- with 1.1 million. NBC was next with 794,000, followed by CNN at 736,000; ABC with 718,000; CBS at 660,000; and MSNBC with 464,000. Among younger 18-49 viewers, Fox had 733,000, followed by NBC with 597,000; ABC and CNN, each with 531,000; CBS at 488,000; and MSNBC with 350,000. Looking at prime-time results -- 8 p.m. to 11 p.m. ET, Fox News was at 5.5 million, while MSNBC came in at 3.2 million and CNN had 1.9 million. Fox News Channel went commercial-free for the day, devoting only on-air promos to its networks and other sister networks, according to iSpot.tv -- with some 42 airings in total. By way of comparison, cable news network competitor MSNBC had 558 airings of paid commercials and 38 on-air network promos, while CNN had 683 paid commercials and 65 on-air network promos.